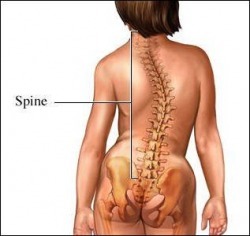 The spinal cord is an continuation of the brain, sending nerve transmission to control and to coordinate the functions of every organ, system and cell in your body. If there is interference from brain to tissue cells that will cultivate the beginning stages of DIS-ease. The spines have 24 freely moving bones. They protect over 3,000,000 nerves that transmit between each vertebra through small holes. Any small misalignment can interfere with nerve energy; than evidence of movement disorders and signs of subluxation gradually start to develop and the patients don't know why they have them. For example, subluxation (misalignment ) in the neck region will interfere with the nerve function, cause in headache, nervousness, insomnia, high blood pressure, chronic fatigue, dizziness, stiff neck, pain in the arms or may be bursitis. Most people take all kinds of medication for these DIS-eases, not knowing the cause of their problem is in the Spine (neck). Misalignment in the upper-back can interfere nerve function, causing asthma and difficult breathing, depression, fatigue functional heart conditions, . Subluxation in the lower back can result constipation, bladder trouble, irregular menstrual trouble such as painful or periods, sciatica, backaches, difficult or too frequent urination, low circulation in the legs, edema in ankles, weakness in the legs.